The number of prescriptions lost or stolen in England jumped by 50% during 2007-08, figures show. Data released by the Conservative Party show that almost 46,000 prescriptions containing sensitive patient data were unaccounted for during the year. The forms went missing in transit between pharmacies and the arm of the NHS that reimburses the costs. A Department of Health spokesman said only a tiny proportion of prescriptions were lost. However, latest figures suggest the number of prescriptions lost during the current year will show another big rise, with almost 46,000 forms lost between April and November 2008 alone. Overall, between April 2007 and November 2008, there were 241 separate incidents where batches of the forms were lost or stolen, health minister Dawn Primarolo said in response to a request from the Tories. The forms contain a patient's name, address, NHS number, date of birth and details of the drugs they are prescribed. In total, almost 364,000 prescriptions went missing between 1997 and 2008. 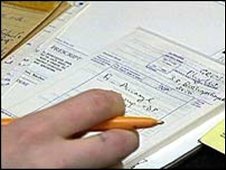 The Conservatives said the government was still sending prescriptions by courier rather than electronically, despite a pledge to do so by 2004. Andrew Lansley, the shadow health secretary, said: "The Labour Government has showed time and again that it is utterly incapable of protecting people's most private details which have been entrusted to them. "This isn't just the odd mistake here and there. It is now nine years since Labour promised to introduce electronic prescriptions which would save costs and be more secure, but patients are still waiting for them to deliver." A DH spokesperson said: "Over 99.9 per cent of the 360 million prescription forms issued annually are processed securely. "All losses or thefts of forms are investigated by the pharmacies involved or the NHS Prescription Services. "Last year we reminded pharmacists of their responsibilities for ensuring forms are transported securely."